With three weeks left in the regular season, the University of Missouri–St. Louis men’s basketball team is 9-3 in Great Lakes Valley Conference play, riding a six-game winning streak and sitting at an overall record of 18-4, the program’s best start to a season since 1971-72. Frank Cusumano, a former UMSL basketball player himself and current co-host of “The Press Box” on KFNS (590 AM), summed it all up nicely when Tritons Coach Bob Sundvold appeared on the show Friday morning. “Let’s welcome to the program the head coach of the hottest basketball team in the state,” Cusumano said. 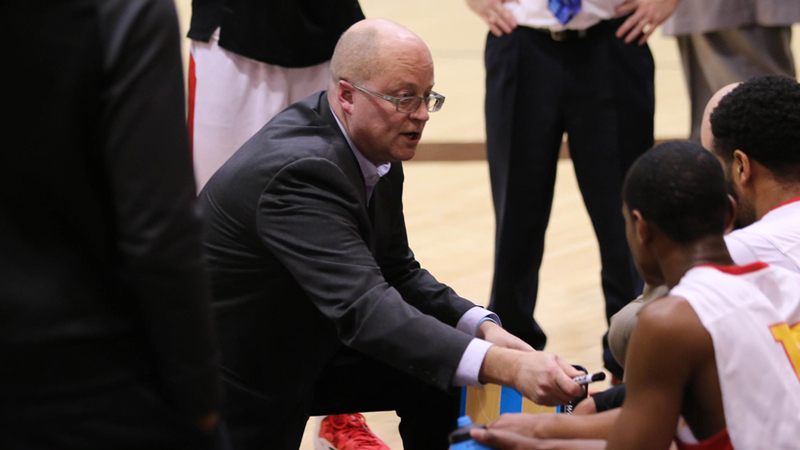 Sundvold, in his sixth season coaching at UMSL, has already helped guide this year’s team to within four wins of the program’s single-season record: 22, set in 1987-88 and duplicated in 1990-91. The Tritons’ successes have come in all shapes and sizes this year, from blowouts such as a 43-point drubbing of Lindenwood–Belleville in early December to improbable comebacks such as a Feb. 2 win over conference foe William Jewell in which UMSL overcame a 16-point deficit in the final 4:25 of the game. The story of the season for the Tritons has been balance, with nine different players serving as the team’s game-high scorer throughout the year. Seniors Johnathan Matthews (14.5 points per game) and Eric Dust (11.0) and junior Ronnie Carson (10.0) have led the way, but supporting players have stepped up throughout the season as well. Last time out, against Missouri S&T on Thursday, junior Jalen Wilkins-McCoy logged career-high marks with 21 points and 12 rebounds. The next opportunity to see the Tritons in action at home is against Drury at 7:30 p.m. on Feb. 21 in the Mark Twain Athletic Center for the “Pack the Stands” game that serves as part of the annual Homecoming festivities. Listen to Sundvold’s appearance on “The Press Box” by clicking here.